Plans to build homes on a former prison site have sparked concerns the remains of former inmates may not be exhumed. 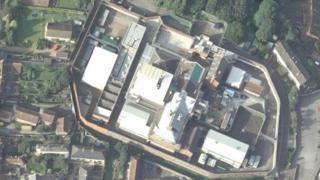 Permission was granted in February to turn Dorset's Dorchester Prison into 185 homes. It is believed Martha Brown, the last woman to be hanged in Dorset, is among former inmates buried at the site. Developer City and Country has not yet confirmed how many of the prison's historical burial plots it plans to excavate. The developer previously agreed any remains at risk of being disturbed should be exhumed. In a statement, it said the project was at a "very early stage" and the "method for excavating... human remains... has not yet been confirmed". It is not known how many bodies potentially lie either within or outside of the prison's consecrated burial ground at sites identified in 2015. A number of public executions took place at the site, including that of Martha Brown - who was hanged in 1856 for the murder of her abusive husband. Her execution was witnessed by the author Thomas Hardy and was said to have inspired his novel Tess of the d'Urbervilles. Oscar-winning screenwriter Julian Fellowes called for all the remains to be exhumed. Lord Fellowes, president of the Thomas Hardy Society and creator of Downton Abbey, said: "It'd be very disrespectful not to exhume all the bodies. "Although they were largely executed criminals, they were human beings." He added: "Hardy was a world famous novelist and it is our responsibility to ensure something as important as the grave of Martha isn't simply buried under a pavement to be trodden on." Richard Greatorex of Cotswold Archaeology, which is carrying out the archaeological works, said DNA testing would be the only way of identifying whether Brown's remains were among those exhumed. Nick Gilbey, who made a documentary about Brown, said all of the remains should be exhumed and reburied in nearby Poundbury Cemetery, allowing people to "pay their respects". However, the Diocese of Salisbury said it would be highly "unusual" for any human remains to be exhumed that would not directly be disturbed by the development. Prisons gained burial grounds in the 18th Century although local authorities began to open municipal cemeteries from the 1850s onwards, according to Historic England.